Backyard decks are a great addition to any home. For one, you can entertain like never before and give yourself a relaxation area after a long day. Having a deck can be a great feature to include in your house, especially because it can raise the total value of your home. But, there are some reasons why your deck can be more of a burden than a blessing — wild animals. Small animals like to seek shelter under decks because they are secluded, dark, and protected from the elements. If an animal is lucky enough to stay under your deck undetected, they have won a home for their lifetime and future generations. However, since some animals can grow and multiply, population control can be a serious problem. And, if your own pets or small children are in danger from your unexpected tenants, someone will have to leave — and it won’t be you! Typically, you will be able to detect if an animal has set up camp under your deck by prints, droppings, and damage to your property. Damages can range in destruction to your lawn or garden. If you notice that the soil of your garden is upturned or if there are plants missing from your garden, it is possible an animal has been using your backyard as their private kitchen. Some animals like to upturn the soil in order to find earthworms, grubs, and other underground insects. This is a great indicator that you have ground animals living on your property. One of the easiest animals to detect in your backyard is a raccoon. Raccoons are fearless creatures that are the least polite guest for a home. You will be able to tell if you have a raccoon if your garden is destroyed and if your trash cans are tipped over. Also, if you have a pet, such as a dog or cat, raccoons will not hesitate to enter your home through a doggy-door and steal leftover kibble. Because of this, if you know you have an animal problem, you need to address it as soon as possible. 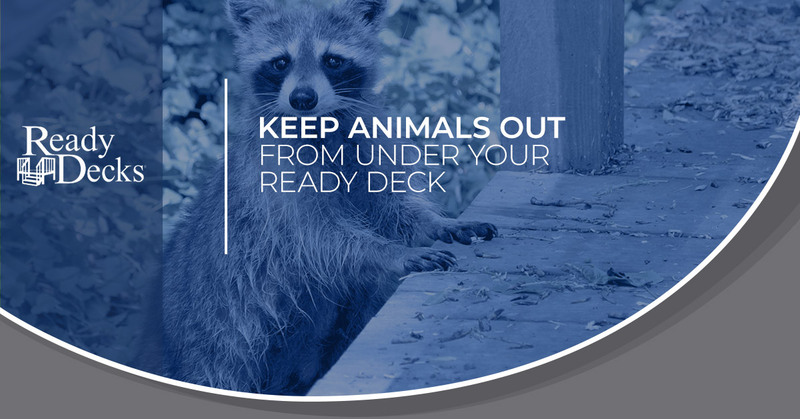 Once you know you have an unwanted animal living under your deck, the next step is for you to evict them from your property. Of course, you will want to do so in the most humane way possible, so try to avoid using poisons. Why? Well, for one, poisons can be toxic to you and your loved ones. And, if you have a pet, they can easily become attracted to the trap you have set up and accidentally become poisoned as well. If you have to evict an animal, you need to use more naturalistic methods and try to clear them using their senses. For example, you can use smell, touch, sight, and taste, to make animals leave your deck. Smell: For smell, you can coat the outside of the deck with a granular repellent. If you sprinkle the repellent close to their living space, it will irritate their sense of smell. Eventually, the animals will get tired of smelling the repellent and eventually leave. Touch: You can always set up repellents to spray when activated by motion. Having this setup can startle an animal enough to where they will immediately leave. You can also position your sprinklers to aim underneath your deck, which will give your tenants a rude awakening. Animals, such as cats and skunks despise water so this method might prove more successful with these types of animals. We will continue this blog in the next part of this series, where we will discuss sight and tastes that animals do not like. Though animals can set up residence under your deck, a backyard deck is still a huge asset to your home and your style of living. If you are interested, contact us today.